Spirits are high in Vancouver with the holidays nearing and sweater weather coming to fruition. Christmas shopping is in full fledge, travel is being planned and families are excited for the chance to spend time together in good company and great holiday meals. But, there are a group of residents in Vancouver who aren’t as fortunate, namely those who reside in the Downtown Eastside. Ron Suzuki, recreation manager of the Strathcona Community Centre spends his life to support children and families in this neighbourhood. Since 1972, he has been an active driver of the Backpack Program, designed to organize, and supply, meals to children who come from families needing government support for the very basic human need of food. British Columbia lacks a poverty reduction plan and maintains the highest rates of child poverty in Canada. This is one of the most expensive places to live in the world and minimum wages do not support costs of living for thousands of families. Impoverished children in Vancouver rarely get 3 meals in a day. Approximately 2,000 children go hungry every day in Vancouver. Another 1.7 million dollars is needed to support emergency food programs, and charitable donations are the only source organized for this. 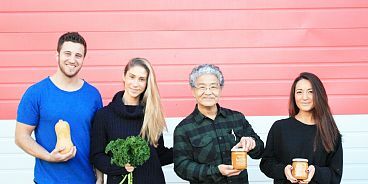 On December 10, local food companies kitskitchen, The Juice Truck, The Juicery Co and Nectar Juicery are coming together to support Ron and the children and families who belong to the Strathcona Community. To drive donations, hot kitskitchen™ soup will be sold at The Juice Truck, The Juicery Co and Nectar Juicery, in Vancouver and North Vancouver. 100% of the proceeds from the sales will be donated to the Strathcona Community Centre. Date: Thursday, December 10, 2015. Suggested Donation for a Bowl: $4.00. Soup will be served all day during regular store hours. On the menu: Butternut Squash + Ginger soup made with all organic, locally sourced ingredients, is wheat free, dairy free and vegan. Made by hand in small batches by the girls of kitskitchen. 100% of proceeds will be donated to Strathcona Community Centre’s Backpack Program led by Ron Suzuki. Specifically, proceeds will support the after school healthy snack program which feeds more than 200 children per day. kitskitchen™ produces healthy, natural and organic soup and spreads made from ingredients sourced in British Columbia. kitskitchen™ products can be purchased at various retailers in the Greater Vancouver area as well as on our online store. Founded in 2011, The Juice Truck is Vancouver’s first and original Cold-Pressed Juice Company. You can find our truck at the corner of Water and Abbott Street in Gastown, Visit our new Store at 28 West 5th Avenue or order our juice online through our store. The Juicery Co. is a cold pressed juice and nut mylk shop that delivers throughout the Metro Vancouver area. Nectar represents the essence of life. Our juice is lovingly pressed to help you feel your best. To feel regenerated to the very core of your being. To be able to live a full, happy life, in even the most fast-paced world.